Like all great games, Diplomacy is very simple. Part of its beauty lies in the basic concept and simple mechanics of the game. This consists of a map divided into a limited number of areas; some of which contain ‘supply centres’, which can each support one unit, either an Army or a Fleet. The movement and combat rules are equally clever, but simple. It is this ‘simplicity and general elegance’ of the game- system that makes Diplomacy such a suitable basis for ‘variant games’, hence the large number of Diplomacy variants. Either the game-system can be ‘lifted’ for use in a new scenario, or the original game itself can provide the basis on which to make some changes. There are a number of different kinds of Diplomacy variants, depending upon the ‘Idea’ behind the variants concerned. The largest of these groups is where the variants are based on new historical and/or geographic ‘settings’. Inevitably they involve a new map and some rules to adapt the game mechanics to suit. Examples include Gesta Danorum, Downfall and North America 2020. Then there are the variants that take Regular Diplomacy and seek in some way to change or add to the game’s ‘system’, retaining the original board but altering the rules. Examples of this group include Stab, Vain Rats, MAD Dip, Seismic and Intimate. However, there is a third group of variants which aim not to change the setting of Regular Diplomacy but instead to change its ‘structure’. They either change the map to include more powers, such as in Cline 9-Man or Mercator, or add a new element which involves certain board changes, such as in Dual Space Diplomacy or Woolworth, or they merely seek to ‘improve’ the basic game. This is based on the view that the actual design of the Regular Diplomacy board has some weaknesses. Whilst most people are content to accept these as challenges or limitations, some have proposed ways of overcoming them by changing the ‘structure’ of the board. Examples of this include Abstraction, Milan and Davis Diplomacy, and this kind of design is the product of certain lines of thought. Italy and Austria are considered to be the two weakest powers in Regular Diplomacy. One of the reasons for this is their mutual lack of security because each has a home supply centre adjacent at the start of the game (Venice and Trieste). Given the option of only one change to the Regular game, some people have suggested the addition of an extra province between the two facing supply centres. This idea was play-tested in a number of face-to-face games in California and “met with critical success”. Futher postal testing indicated that the extra province was a good idea, but it should not contain a neutral centre. When this option was tried, it resulted in permanent conflict over it between Italy and Austria and so had the opposite of the intended effect. Fred C. Davis has used the idea in several of his variant designs, dividing Trieste into two separate provinces. The northern half becomes the minor province of Croatia, the Austrian home supply centre being moved to the southern half, named either Zara or Split. In the initial play-tests it was merely ‘Province X’ and with a neutral centre it became Peerijavo, named after Lawrence Peery. Neither of these touched Vienna or Budapest, whereas Croatia does. 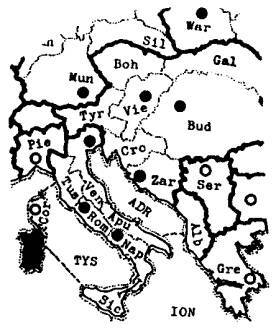 The effect of Croatia is to strengthen Austria and Italy, protecting both from immediate incursions by the other, and making it easier for them to work together as a team in what can be a very strong combination. The only other suggested ‘one-change only’ variant to gain any support is the idea of changing the starting unit in Rome from an Army to a Fleet. F Rome Diplomacy is currently popular and I believe records are being kept to see if this change strengthens Italy and improves its poor track record by given greater flexibility. As Italy is mainly surrounded by water, Piedmont and Venice can act as something of a bottleneck, preventing easy invasion of Italy by land but making it equally hard to get out. “Italy is unable to expend initially; it is restricted to a purely defensive role in the middle years; and its prospects are limited to a minor share in a draw or a low place”. Another solution to the problem of Italian land access, the position of Venice and Trieste as facing home centres, and the resulting Austrian and Italian weaknesses, is offered in the recently published Milan Diplomacy by John Norris. This involves limited changes to the geography of northern Italy so as to improve her attacking chances and make “Italy a less boring and rather mere successful country”. There are likely to be a number of games offered of Milan to test its possibilities. In Milan Dip the former Piedmont is divided into two new provinces of Savoy and Milan; Rome is also extended to take in the former province of Tuscany and now also touches the Gulf of Lyons, Savoy and Milan. Milan itself touches Switzerland, Tyrolia, Venice, Rome and Savoy. 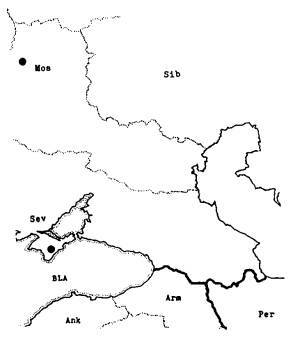 The remaining western half of Piedmont is renamed Savoy and touches Switzerland (though not Tyrolia), Milan, Rome, the Gulf of Lyons and Marseilles, and is extended in the north-west to touch Burgundy as well. As the home supply centre in Venice is moved to Milan, Venice is renamed ‘Venetia’, following the convention that only home supply centres are named after cities. 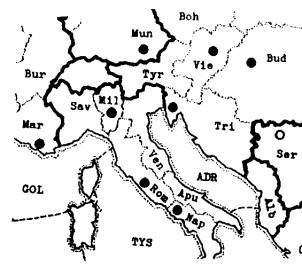 As with the dividing of Trieste, this reduces the likelihood of conflict between Italy and Austria, and Milan also gives greater prospects of going west into France. Unlike F Rome, it still doesn’t give Italy such strength at sea in the Mediterranean. There exists a pirate version of Diplomacy in Portuguese, produced in Brazil and usually known either as ‘1914’ or the ‘Brazilian variant’. Like Peerijavo it introduces a 35th supply centre to prevent the possibility of a 17-17 draw, but placed in a different and mere successful location; North Africa is divided into two new provinces of Algeria and Morocco, which contains a neutral supply centre. The effect of this change is to make the area of the board more interesting, and linked with F Rome it becomes a likely gain for Italy, strengthening her position and further drawing her away from conflict with Austria (or at least, that’s the theory). The division of North Africa is also an example of a way of improving fluidity in Diplomacy by providing additional spaces for manoeuvring. This is another advantage of the creation of Croatia, part of the intention behind Milan Dip and the reason behind other suggested province additions. For example, a number of variants which involve modifications to the basic game have included a sea area called the South Atlantic Ocean below the Mid-Atlantic and which touches the Western Mediterranean. By shielding a Morocco supply centre from incursions by English and French fleets, SAO makes the centre a more secure gain for an Italy with F Rome. The creation of SAO along with Morocco and Algeria also helps in making it easier to move between the Med. and Atlantic, as Italy’ s enhanced sea power causes a need for more spaces in which to move. This is also the reason behind adding spaces such as a ‘Southern Mediterranean’ and by implication this particular addition completes the Mediterranean coastline. Whilst the creation of the new sea space SAO may make it easier for fleets to move from the Med. to the Atlantic, this is still hindered by the MAO touching both the north and south coasts of Spain. This means that Portugal is the only space on the board bounded by only two other spaces. One solution to this would be for SAO to touch Portugal, but unless Spain itself were divided, this would block direct movement from the Western Med. to MAO and the Gibraltar bottleneck is partly restored. An alternative solution is to create a new sea space ‘Bay of Biscay’, and even to extend this round to touch Portugal. 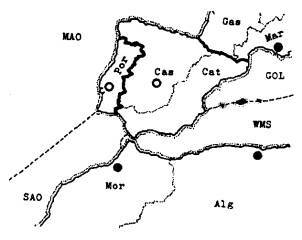 This eliminates most of the problems associated with the two coasts of Spain as only one of these now touches MAO, and it provides an ‘inside track’ for movement between Brest and Portugal. Russia and Turkey are amongst the stronger powers in the Regular game, partly because of their, corner positions, and partly because the design of the board makes it difficult for them to pose a threat to each other earlier on in the game. This is the reason for the idea of creating new spaces in the east of both of these countries, including some options as ‘Persia’ and ‘Siberia’. Persia is created out of the eastern part of Armenia and Syria, and touches these along with Sevastopol and ‘Siberia’. The eastern fringe of Moscow becomes ‘Siberia’ which also adjoins Arkangel and joins round the Caspian Sea to touch Persia. These changes have the same effect of opening new movement possibilities and turn attention towards Russia and Turkey’ s eastern flank; Though an eastern Russian province may be called by other names than Serbia (Vol, Ura, Kaz etc) this basic idea remains the same. Just as the addition of new areas in the east of the board may increase the likelihood of conflict between Russia and Turkey, it can make it more difficult or less likely between Russia and England by creating a buffer area. 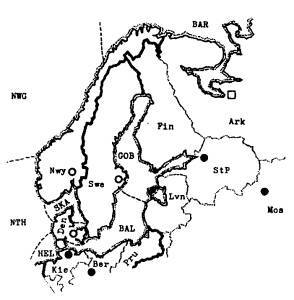 This is done in numerous variants by replacing the northern part of St. Petersburg with a new province usually called Arkangel and which adjoins Finland, Norway, the Barents Sea, ‘Siberia’, Moscow and StP. StP remains as the supply centre, but without a northern coast it is now protected from the Barents Sea and the fantastic move Nwy-StP. The ability of Russia to build a fleet on the shores of the Barents Sea is retained by the introduction of the idea of a ‘special build centre’. This allows Russia to build a fleet in Arkangel if it is still vacant, she still holds StP, and has an available build. In variants which add any more supply centres, Arkangel usually becomes such. Despite Diplomacy being an abstract game, certain variant designers have taken exception to what they see as historical anomalies on the Regular board. One of these is the fact that Ireland and Sicily are impassable, despite having been integral parts of the United Kingdom and Italy in the period in which Diplomacy is loosely ‘set’; So, in quite a few variants they have been made passable. This is justified either by them containing a supply centre, and/or if a ‘Direct Passage’ link to the mainland is used. This means that all units may move directly between the two provinces thus connected, as if they were adjacent. The movement of fleets at sea is completely unaffected. The addition of sea areas and coastal provinces is also one way of increasing the role of fleets in Diplomacy. Even so, they lack some flexibility, and combined operations with armies are barred by the Calhamer convoy system. The alternative is to use the Army/Fleet ‘piggyback’ concept designed by Fred C. Davis, which is used in many variants and contained within the A/F Rules Module. In this Armies may actually board the fleets and be carried further around the map. The support and movement rules for A/Fs also speed up their progress and make them more powerful. They certainly make for a more fluid game and the variants which include a great deal of water, such as the global games 1ike Mercator, would have been otherwise impossible. The A/F rules were first created for the variant Abstraction, which was initially designed to correct the “mistakes” which Allan B. Calhamer made on the Regular board (in Fred C. Davis’s opinion). The designing of Abstraction took all of the lines of thought already outlined and brought them to a sensible conclusion. An additional supply centre and some internal provinces were added to each great power, the entire south shore of the Mediterranean was included, along with additional sea areas, land provinces and neutral centres. Inadvertently the design also eliminated most of the stalemate lines of the Regular game, although it was not consciously intended to do so. Although being one of the earlier variant designs, it continues to be played, which is some testament to its quality. However, most of the variants which are modifications to the basic game do not go as far as Abstraction and only include some of the individual possible changes described, rather than as part of an overall plan as in Abstraction itself. Davis Diplomacy comes mid-way between the minimum change of Milan Diplomacy and Fleet Rome, and the ultimate conclusion of Abstraction. It was originally designed in 1970 for use in face-to-face games and was more recently revised. It represents one of the better examples of the reason for making particular changes to the Diplomacy board.